Tag line: "The Star Wars saga continues"
I know I’m not alone in declaring 1980’s The Empire Strikes Back (aka Episode V) my favorite film in the Star Wars series. A sequel to 1977’s mega-hit, Star Wars, Empire has as much action and adventure as the original, but takes the story in a whole new direction. As the movie opens, the Imperial fleet is closing in on the Rebels, who’ve set up a secret base on the ice planet of Hoth. Following an intense battle, during which the rebel army is forced to abandon their base, Luke Skywalker is contacted by the spirit of Obi Wan Kenobi (Alec Guinness), who tells him to fly to the swampy marshes of Dagobah, where he’s to be instructed in the ways of the Force by Yoda (voiced by Frank Oz), the wisest Jedi of them all. Meanwhile, Luke’s good friends Han Solo (Harrison Ford) and Princess Leia (Carrie Fisher) are running for their lives aboard the damaged Millennium Falcon, with the Empire hot on their trail. After a brief layover on an asteroid, they head to Cloud City, a floating facility that hovers over the gas planet of Bespin, to seek help from Han’s old buddy, Lando Calrissian (Billy Dee Williams). But as Luke and the others will soon learn, the power of the Dark Side is strong, and the Imperial forces, under the command of Darth Vader (David Prowse, with voice provided by James Earl Jones), aren’t so easy to outrun. Where Star Wars was all about good vs. evil, with the hero rescuing the Princess and destroying the enemy in the process, The Empire Strikes Back swings the pendulum in the other direction. The battle on Hoth is just as spectacular as any action sequence in Star Wars, but with a much different outcome. Here, it’s the Empire who wins the day, putting the rebels on the run and, in essence, scattering their already meager numbers to every corner of the galaxy. This is the first of several bad breaks to come our heroes’ way in The Empire Strike Back, a darker movie than Star Wars in many respects. Gone is the celebratory climactic scene; there are no victories at the conclusion of this film, which more than lives up to its title. 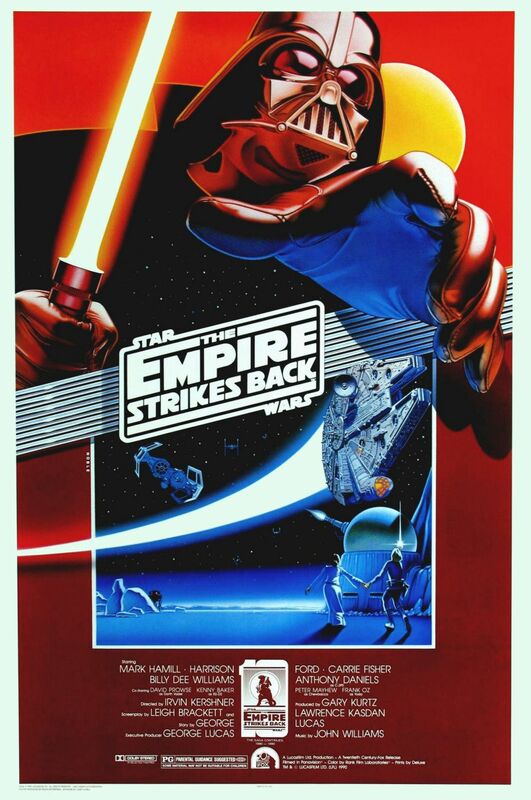 In this second outing, the Empire does, indeed, strike back, and in a big way. In Star Wars, Luke Skywalker was a kid who went looking for adventure, and found it. When all is said and done in The Empire Strikes Back, circumstances have forced him to grow into a man, and deal with the ultimate realization that he must mature even further if he’s to have any hope at all of defeating the evil the controls the entire galaxy. Empire Strikes Back might be my favorite movie of all time. I was surprised to learn that it wasn't directed by George Lucas but by Irvin Kershner. Also the screenplay is by Leigh Brackett one of my favorite women writers. I read somewhere that she was hired by the studio who mistakenly assumed she was a man.